Home / Posts Tagged "affordable chocolate fountains"
It has been brought to my attention during consultations that many people do not know what to ask or look for when they begin the search for that extra special “sweet” service for an event like a chocolate fountain, candy buffets, cupcakes etc. Experience in this industry has taught me that many companies are out to look like they are running a “special” or “exclusive” package price when in fact they are misleading in not only what they provide but more in what you will actually need come your wedding or event day ie: overpromising and under-deliverying. For example, if you check out the company website and it is an ongoing discount, most likely it is not a special. A true special is not something you run all the time. So with that said, I wanted to inform you the consumer about things you should be asking and thinking about when choosing your “sweet” service. 1. Does the price look to good to be true? Take the time to read the small print and do the math. For example, if the dipping items are not priced seperately, make sure the venue allows outside food to be brought in. Ask how many pieces per person it serves. Offering 6-10 items might sound like a super idea, but not if that means that each person only gets three items. The food will be gone within an hour of your event and your guests will be wondering why their isn’t enough. Many hotels and some venues do not allow outside food to be brought in, so call and check that out before you sign your contract. 2. What kind of chocolate is the company actually using? You get what you pay for. If the price of the fountain looks too good to be true, they are not running a true, premium chocolate. Most Chocolate Fountain companies use a canned product that is less expensive both in cost and in labor hoping you the consumer will not know good chocolate. It is also called bulk and courture. It is a must to do a tasting to see and taste the chocolate before the night of the event. One hint: If the claim is semi-sweet and the chocolate is really dark, that is probably NOT the chocolate you want at your event….just sayen. 3. What will the presentation look like? 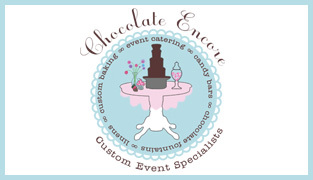 At Chocolate Encore everything is customized to your event. You are not last weekends client and so your presentation will not reflect that party, but your own theme with coordinating fabrics, elevations and glassware. Make sure to check out a companys’ photo gallery to see what they offer. Make sure you are not looking a stock photography but actual representation of their work. These are just a few ideas of what to watch for and ask when selecting your sweet provider. If you have any other questions or concerns, we would be happy to help you design and assist you with your upcoming event. Don’t forget to check out our other sweet services. Have a sweet idea you need executed? We are happy to help make that vision a reality. Check out some of our past event on www.facebook.com/chocolateencore – Have a really sweet day!